Nokia brand phone maker HMD Global has launched Nokia 7.1 smartphone in India a few days ago. Android One smartphone Nokia 7.1 will be sold from the company's online store Nokia.com on December 7. The price of Nokia 7.1 in the Indian market is Rs 19,999. This price will be directly tied to Nokia 7.1 with Realme 2 Pro and Xiaomi Poco F1 smartphone. Speaking of the main feature, Nokia 7.1 has a pyredisplay panel, dual rear camera setup, Karl Zine Optics and 3060 mAh battery. 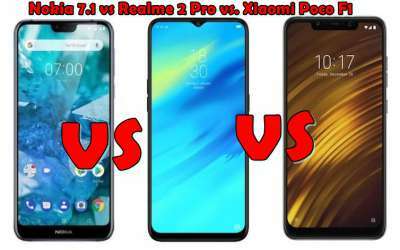 Let's now understand the difference between Nokia 7.1, Realm2 Pro and Shaomi Poko F1 based on price and specification. Nokia 7.1's 4 GB RAM and 64 GB storage variants will be sold for Rs. 19,999. Sales will begin on December 7. Smartphones will be available in renowned retail stores across the country. In this market, 3 GB RAM / 32GB storage variant was also launched in this phone, which has not been brought in India at this time. Speaking about the launch of Nokia 7.1, the company has partnered with Airtel. Prepaid customers will get 1 TB 4G data. Additional 120 GB data will be provided to Airtel postpaid subscribers, along with a three-month Netflix subscription and 1 year Amazon Prime Subscription. For this, a postpaid plan of at least Rs 499 should be active for Airtel. Customers who use HDFC Bank's credit and debit cards to buy Nokia 7.1, they will get 10 percent cashback. Price of Realme 2 Pro starts at Rs 13,990. This price will be sold to 4 GB RAM and 64 GB storage variants in this model . The handset's 6 GB RAM and 64 GB storage variants are priced at Rs 15,990. The most powerful variant of Realme 2 Pro is Rs 17,990. phone is equipped with 8 GB RAM and 128 GB of storage. Like Realm 2, this phone is also sold exclusively on e-commerce site Flipkart. the Customers can buy this phone in Black Sea, Blue Ocean and Ice Lake colors. In the market, Xiaomi Poco F1 6 GB RAM and 64 GB storage variants will be sold for Rs 20,999. On the other sagment of the price of 6 GB RAM and 128 GB storage variant will be Rs 23,999. The phone's 8 GB RAM and 256 GB storage and the variants will be sold for Rs. 28,999. The smartphone has a polycarbonate back. It will be available in Rose Red Steel Blue and Graphite Black Color. In addition of this set an Armored Edition of Poco F1 is also offered which costs Rs 29,999. This handset is also sold on Flipkart, Mi.com and offline. Nokia 7.1 with the dual-nano SIM runs on Android Orio. This Android One smartphone claims to have an Android pie update until next month. Nokia 7.1 with a 19: 9 aspect ratio has a 5.84 inch full HD + (1080x2280 pixels) display. The screen comes with 2.5 de Curved Glass and Corning Gorilla Glass 3 protection. The screen-to-body ratio is 80 percent. Talking about storage, the inbuilt storage of Nokia 7.1 is 64 GB and if necessary, up to 400 GB MicroSD card can be used. Nokia 7.1 will get 4 GB RAM The Qualcomm Snapdragon 636 processor has been used in the phone. There will be two cameras on the back side for photography. The 5-megapixel secondary sensor with F / 2.4 aperture with primary sensor of 12 megapixels with F / 1.8 aperture will work in a bugle. There will be an 8-megapixel front camera for selfie and video calling, its Apache is F / 2.0. This Nokia brand comes with Dual flash and Carl Zeiss optics. The phone has a hybrid sim slot. The user can use two Nano SIM cards or one Nano SIM and one MicroSD card at one time. For connectivity, Wi-Fi is 802.11A / B / G / N / AC, Bluetooth 5.0, GPS / A-GPS, GLONASS, NFC, Type C (USB2.0), OTG, 3.5mm headphone jack and Nokia OZO audio support. Ambient light sensor, proximity sensor, accelerometer (G-sensor), e-compass, gyroscope and fingerprint sensor are part of this phone. The battery of 3060 mAh will work in the handset. It comes with fast charging support. The dimensions of Nokia's handset are 155x75.5x7.85 millimeters and weighing 160 grams. Dual-SIM Realme 2 Pro runs on Android OS 8.1 based on ColorOs 5.2. The smartphone has a 6.3-inch full-HD + (1080x2340 pixels) big display. Screen to body ratio is 90.8 percent. Asspect ratio is 19.5: 9. Pixel density is 409 pixels per inch. The Snapdragon 660 AIE octa-core processor has been used in the smarphone . The Adreno 512 GPU has been given for graphics Based on RAM and storage. this handset has three variants - 4 GB RAM / 64 GB storage, 6 GB RAM / 64 GB storage and 8 GB RAM and 128 GB storage. If required the phone will be possible to use MicroSD card upto 256 GB in all the variants. Now talk camera setup. Realme 2 Pro has dual rear camera setup. The primary sensor is of 16 megapixels. It is equipped with F / 1.7 aperture, 6p lens and Sony IMX 398 sensor With it, there is a 2 megapixel sensor in the buzz and the Users will be able to record 4K video at a rate of 30 frames per second. The front panel has a 16 megapixel sensor with F / 2.0 aperture. It is equipped with AI Beauty 2.0. The AIi features are provided in the camera for portrait mode. Supports of this phone is AR stickers with phone front and rear camera. Realme 2 Pro features light and distance sensor, acceleration sensor, gyroscope and geomagnetic sensor. The dimension of Reality 2 Pro is 156.7x74.0x8.5mm and weighs 174 grams. Realy 2 Pro's battery is 3500 mAh. Connectivity features include USB OTG, Wi-Fi 802.11 AC, Bluetooth, 4G VoLTE and GPS. In the market, Xiaomi Poco F1 6 GB RAM and 64 GB storage variants will be sold for Rs 20,999. On the other hand, the price of 6 GB RAM and 128 GB storage variant will be Rs 23,999. The phone's 8 GB RAM and 256 GB storage variants will be sold for Rs. 28,999. The smartphone has a polycarbonate back. It will be available in Rosso Red, Steel Blue and Graphite Black Color. In addition, an Armored Edition of Poco F1 is also offered which costs Rs 29,999. This handset is also sold on Flipkart, Mi.com and offline. Dual-SIM Xiaomi Poco F1 Out of Box will run on the MUI 9.6 based on the Android 8.1 Orio. MIUI 10 update promises to be given soon. The company has also promised to provide Android P update. Xiaomi has informed that he is using the customized version of the MUI for Poco F1. Some changes have been made in the interface. Poko Launcher stock sounds like Android UI There is also support for third-party app icons. Poco F1 has a 6.18 inch display that comes with 2.5 de Curved Gorilla Glass Protection. The Qualcomm Snapdragon 845 processor is used in the phone, which comes with LiquidCool technology. As we told you earlier, 6 GB and 8 GB RAM have been given for Jugalbandi. Speaking of camera setup, there are two cameras on the back of Xiaomi Poco F1. The primary sensor is of 12 megapixels. This is the Sony IMX 363 sensor. The same sensor is used in the flagship phone such as Mi8 and Mi Mix 2s of Shaomi. The second 5 megapixel is Samsung's depth sensor. The front camera is 20 megapixels, which is equipped with HDR and AI beauty features. The phone has infrared light which works in the Face Unlock feature. Xiaomi told that the AI camera has been tuned to India and there is also a Scene Recognition feature. The company has talked about being the DirectX HD Sound Support.